« JAPE: The Worry Fades – New Song! 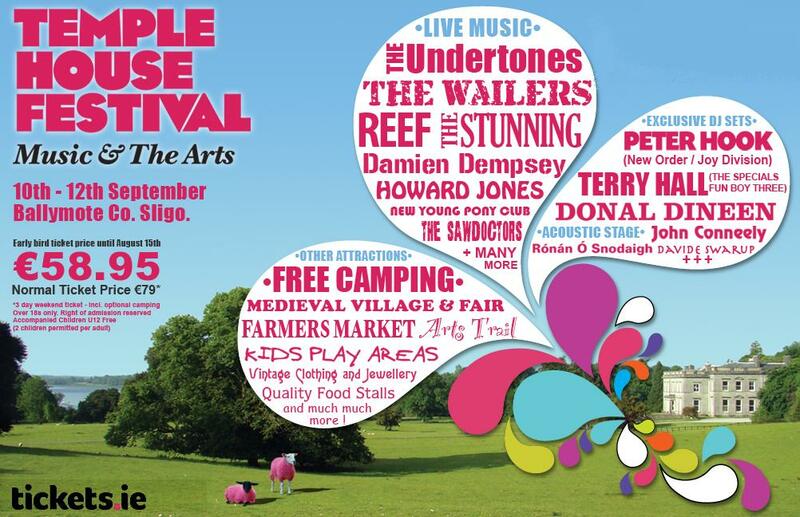 The line-up for this years Temple House Music Festival in Sligo just keeps on growing. TH has announced the following additions the their lineup. This is on top of already announced acts The Undertones, The Wailers, The Stunning, Reef, Peter Hook (Joy Division / New Order), The Walls and many, many more. There’s an early bird special on until August 15th with 25% of tickets. Three days camping for €59! Now how are ya gonna argue with that? Visit their official Website by Clicking Here. This entry was posted on August 12, 2010 at 3:54 pm and is filed under IRISH NOISE!, Music, News with tags Reef, Temple House Music Festival, Temple House Music Festival Sligo, The Stunning, The Undertones, The Wailers, The Walls. You can follow any responses to this entry through the RSS 2.0 feed. You can leave a response, or trackback from your own site.